Coming up we’ll hear an important interview with David Smith, Senior Analyst at The Morgan Report and MoneyMetals.com columnist. David gives precious metals investors some tremendously useful advice in the face of some difficult market action for gold and silver -- and he also tells us why he believes 2017 will be the year that general public discovers gold and silver in a big way. 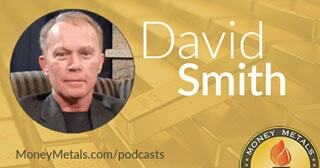 Don’t miss my conversation with David Smith, coming up after this week’s market update. Precious metals markets have been slammed hard in recent days. Hawkish comments from Federal Reserve officials drove a breakdown of support levels in gold and silver, and that breakdown trigged a wave of heavy technical selling. Gold suffered its biggest down day in nearly three years, while silver dropped 10% on the week through Thursday’s close. Rick Santelli: What if the central banks all get together and decide, "Well okay, we don't want that to happen, let's buy Deutsche Bank, or when any other bank or a company is in trouble. We'll buy that," or as you get the political highlight points, like at election times. You want to keep everything pretty clean. Make sure nothing goes down. Is that the world we really want to live in? The bad news for metals bulls is that prices are down and the near-term momentum is negative. The good news is that sharp, severe corrections like these are often quite short in duration. They typically represent good buying opportunities. The name of the game is to buy when value opportunities present themselves and not worry about trying to pick a bottom. You won’t buy in at the exact bottom of any pullback in markets as volatile as these unless you’re incredibly lucky. Well, luck isn’t on the side of those whose homes are right in the path of a massive storm. As a devastating Category 4 hurricane rips along the Florida coastline and moves up the Atlantic coast, millions of people have faced the prospect of severe property damage and protracted power outages. In recent days, gasoline shortages spread throughout the southeast and grocery store shelves were stripped bare of bottled water, batteries, and other emergency supplies. In any kind of disaster situation, those who fail to prepare – or wait too long to prepare – will be the most vulnerable. You can never know when a freak weather event or natural disaster or man-made disaster or financial meltdown might adversely affect you and your family. Regardless of where you live, make sure you have emergency backup supplies of bottled water and long-lasting food on hand. Backup power sources, including solar and gas powered generators are also worth considering. Make sure you are ALSO prepared for a financial emergency. The banking system is fragile and vulnerable to any number of threats, including derivates blow ups and cyber attacks. If banks close and ATMs become inaccessible, you’ll be glad you kept an emergency cash stash. But don’t put your full faith in the value of the dollar. It is sure to lose value over time and could one day suffer a massive loss of confidence all at once. If top Treasury and Federal Reserve officials get their way, cash in the form of coins and bills will no longer even circulate in a future cashless economy. Of course, silver is the more practical metal for smaller transactions. One-ounce silver coins and rounds will be widely useful. For smaller transactions and to make change, you’ll also want to have some fractional sized silver. Pre-1965 90% silver quarters and dimes are essential for any barter stash. During an economic panic or retail silver shortage, premiums on pre-1965 silver coins could surge. It’s best to stock up on these historic, no longer minted coins while premiums are still low, as they are now. And finally, don’t worry about being ridiculed for diversifying out of the financial system. The ones doing the ridiculing are the same ones who didn’t see the financial panic of 2008 coming. And today, of course, they don’t see any trouble ahead for conventional investments. CNBC Anchor: I'd rather have cash because both assets are of value. Steve Liesman: Some people have thought that for the last eight or nine years. And they've missed a very powerful move, both in the bond market and in the stock market. I wish them well. And some of them are also sitting on great big piles of gold, or perhaps cans of tuna down in their bunker. No, you don’t need to build a literal bunker or go overboard with stockpiling enough food and supplies to last you for decades. But it is prudent to have at least one month’s worth of survival essentials readily accessible in your home. Better to end up never needing it than to one day need it and not have it. Mike Gleason: It is my privilege now to be joined by David Smith, senior analyst at The Morgan Report and regular contributor to MoneyMetals.com. David, it's good to talk to you again and welcome back. David Smith: It's always good to be back, Mike and we're in momentous and interesting times right now with the metals and the miners. Mike Gleason: Yes we are. Well as we're talking here on Thursday morning David, the metals have a faced a tough week so far. Silver fell nearly a dollar on Tuesday alone and gold sold off more than $40 that day which are some big, big moves for both metals. They're continuing to drop a little bit here Wednesday and Thursday. Now when we had you on back in July, you were calling for a pull-back and after not seeing much deviation from the range trades that persisted in the two-plus months since that conversation, we finally saw the range broken to the downside here this week. So we are finally getting that correction just like you had predicted. Before we get into what a great opportunity that this is presenting to metals investors, give us your thoughts on what's driving the correction here. Is it just technical selling that's driving this now that we've take out support levels and then do you think it's going to be short-lived or do you see more downside to come? David Smith: Well Mike, I think a lot of use were looking for a potential correction from May on really, because this has been an historic rise in the mining stocks and to a lesser extent the metals themselves. But there was kind of like rope-a-dope going on the last couple of months before this thing finally hit and it looked like, "Oh this could be a correction and it would go on up and make a new high," and that's the sort of thing that shakes a lot of people up. Well, we’ve finally got it. I think this is what we've been waiting for and hoping for, until I came here at any rate but it is the pause that refreshes. And it's painful now but it's important for people to realize that if we didn't have something like this and it goes up vertically and gets out of control, then it's going to crash and burn the same way which I believe most of us believe will happen and we want to see, if we want to see an enduring market in the gold and silver (markets) and the mining stocks that last through several years we need to have this type of a consolidation and re-tracement in order to shake out the weak hands. This is what Mr. Market does and then it consolidates and makes a new platform and then goes off on its way up again. Mike Gleason: Despite the fact that we did breech support on the charts, is the longer term uptrend that began back in January still intact? What's that looking like now, David? David Smith: It really is. A lot of people look at sloping trend lines and the professionals tend to spend a lot more time on what are called the horizontal support and resistance so you want to look at lines that have held before, drawn in a line right across the chart and look at some of these longer term lines and not get wrapped up in the 50 day (moving average) so much or even the 200 day. Some people even look at the 20 month. So when you look at the bigger picture, bigger, bigger, bigger, then you can see what's going on over a period of years and not get caught up in what's going on right in front of your face and then get too emotional about it. Mike Gleason: Yeah, and people should keep in mind that despite being off their highs from a couple of months ago, silver is still up almost $4 on the year and gold is up about $200. So it just shows you how fantastic they performed over the first 6 or 7 months of the year so a pull-back was definitely in the cards, as frustrating as it may be to witness for precious metals bulls… mining stock investors, bullion investors and so forth. I want to get into your most recent article here for MoneyMetals.com where you talk about how 2017 is going to bring about a public recognition phase for gold and silver in your view. Give us some insights into your thinking there. What will cause the average investor to get precious metals religion next year, David? David Smith: Well, I think if you look at how bull markets get started, regardless of what the product is, it's going to be a bull market. Usually, the public doesn't pay attention for about a year after it gets started. And then they start seeing more positive articles and their gurus start talking about it and they look at charts and things like this and they start getting interested. And it's kind of funny. People tend to get interested once the price has risen quite a bit, most people. So they don't want to buy when it's on sale because it could go lower but they think if it's high it could go higher. They assume that will happen and then start coming in. So I think next year, because of the culmination of a lot of the problems that we've had that are getting harder and harder to cover up at the international level, I think people are going to start seeing that they really need to hold some gold and silver if they don't have it or even add to it because this business of trying to move everybody into digital transactions where you don't use cash at all for things, all this is is a control technique on the part of governments around the world because they can track everything you do and if they want to have negative interest rates they can debit your account and things like this. So gold and silver are even more important now than they've ever been before. That's why we have this move by the governments to restrict our ability to have some kind of privacy. Mike Gleason: In that article, you talk about some key levels on the charts that you're looking at down the road as we move higher, talk about that and then what do you think may happen once we do take out some of those key technical levels overhead for gold and silver? David Smith: I think there are a couple of levels. This is not just exactly to the nearest penny, but let me round it a little bit. I think $26 for silver is extremely important because that was an area that a couple of years ago was penetrated after 4 attempts on the downside and when you see a price go 4 times over a period of months to a certain level, you really want to pay attention so it broke through that at $26 and then went down into the low teens and it took a couple more years to do that. So when that level has penetrated not just a poke, but when it gets up there and establishes a platform to move on up, I think that people are going to go, "Oh, my gosh. Look at this. This is huge." And they're going to get really, really getting interested and of course the smart money has been buying before that. But they'll be continued to add and then the new people coming in will add more impetus to the volume and this doesn't operate in a vacuum because other things will be going on in the greater scheme of things, politically and economically and things like that which will be supportive of that. And then for gold, you could actually say a band of $1,450 to $1,550, but I think to be safe, I think you’re looking at $1,500 to $1,550. When prices get up there and spend a few days there and get ready to move on up, people are going to go, "Oh, my gosh. It's only $350-400 away from its all-time high, I'd better get going." And those 2 levels, they may not occur at the exact moment because gold and silver play tag-team in the bull market, but one of them will get there at that level that I just mentioned and then at some point within maybe a few weeks or even a few days, the other one will reach that particular other critical level for itself and then you'll have a matched pair and then it'll be off to the races. And that will become an emotion driven market much more than a fact driven market and that's what's going to cause the metals to move very quickly upward to challenge the belts of resistance up to their nominal highs of 2011, which is around $50 for silver and around $1,900, I think $1,923 was the exact high for gold. Mike Gleason: We're a little bit further away from those key overhead levels now. $26 silver is a little further away than it was just a few days ago so investors may have to wait a little bit here in order to see that line approached. I love having you on during weeks like this David because your calming voice of reason is just what the doctor ordered for many metals enthusiasts. Now it has been very encouraging that we've seen some tremendous demand and huge buying this week in the physical market as the dip buyers and bargain hunters have been out in droves so perhaps some people are keeping the bigger picture in mind finally, but talk about investor's psychology here for a minute because while many may be seizing on this buying opportunity that seems to be presenting itself during a week like this, a majority of folks still aren't because perhaps they've gotten spooked. What advice do you have for people here? How do you keep from letting your emotions get the best of you during volatile market conditions? David Smith: Guy Christopher made a comment on my article on the website there a few days ago and I commented to him and I used the quote by Stu Thompson when he talked about the fact ... This guy's a real professional, you know. He says, "We all have to undergo pain when we buy and price declines. And we just have to admit that we all feel that way and we have to go against that when we've done our research.” And that's what it is, and if you're not willing or able to do that then you're not going to make the big score. So that's the bottom line. You (need to) go against that. It isn't easy for me to add money stocks this week. I put some orders in. That's another thing. You put the order in, you decide where you're going to go if it gets there and when it does you do it and you block out all that side reference and it's a good feeling knowing that you bought quality company for 30-40% off from what you would have paid a month ago and you go about your business. And another thing I think that helps, and this is not just from mining stocks, but it's also for physical buying too. Maybe people that are considering buying some more gold from you and silver, or if they've already bought some or a new position, don't say, "Oh, today must be the bottom. I'm going to put every cent that I have into this situation” because it may be but it probably isn't. But if you go in trenches, and this is something I've written about a number of times on the site. If you buy in portions, let's say if you want to put X dollars into silver and you think, "Today looks good. It's down sharply," then buy half of what you intend to buy, your whole program. Tell yourself, "How much do I want to contribute to this idea altogether?" And then buy half of it or buy a third of it. And when you do that, it turns the psychology of investing on its head because if you buy today and silver's down another 50 cents tomorrow, you are just absolutely rubbing your hands together because you're going to get it cheaper tomorrow or next week or whenever that is. And so you won't be in a panic if you bought it all today and then you go, "Oh, I was wrong. It's down tomorrow," then you're immediately being upset. So it's about controlling your emotions and you've got to do that otherwise you just have a lot of heartburn. Mike Gleason: It's certainly good to keep some powder dry but then also seize on the opportunity that presents itself. Don't overthink it, especially if you're convicted and you understand why you want to own this stuff in the first place. Now offline, before we got going here, you were talking about something you just ran across regarding tunnel vision. Talk about that. I thought that was great. David Smith: I been thinking about this in terms of any kind of threat management, whether you're looking at an accident on the freeway that you're trying to avoid or whether you've been attacked by a mugger or whatever it is or whether, or your accounts have been attacked by falling prices. What happens, when any kind of a threat is going on, this goes back to the caveman days. You know Mike, this is something too… I call us today, primitives with computers. We have these computers and we can push a button and do all this stuff or use our cell phone to buy and sell but we still operate out of the reptilian brain. And the moment that something goes on that startles us that we hadn't planned on, we go right back to what we did in the old days and we develop this tunnel vision and we block out everything on the side and we're focused on the threat. And for now the threat is lower prices in the metals. You're looking at that and you're getting emotional and it starts out as a thought and then it becomes an emotion and then it goes into your stomach and it's hard to operate that way when you let all that take place. But if you realize tunnel vision is the sort of thing that nature gives us to deal with a problem. You go into that and you focus on what that threat is but you can come back out of it and look around and then you can go back in again. You look at the prices, you look at the chart. You see where silver and gold are down today and then you can come back out and look at the bigger picture and go, "Wait a minute. Why did I buy in the first place? It's because I believe that because of all the problems that we have that aren't solved and also because of the love trade coming out of China and India, 3 billion people are going to be buying more gold and silver with their new wealth, that this story has a lot of merit. I'm a believer in it so why am I upset now? Why am I not happy that I'm getting something on sale that I hadn't planned on?" I went to the grocery store yesterday. I like this type of tea, Numi Tea. They don't put it on sale very often and so I was looking to buy 2 or 3 kinds. I walked in. It hadn't been on (sale) for a long time. It was on for $2.50 a box off. I was going to buy just a couple boxes altogether. I went in and I saw that, I bought about 10 boxes because that's a deal. I just made my money go farther. And so I think if you look at the metals and the miners the same way and you buy in trenches and you do your research ahead of time I think you'll be well ahead of the game and when this is over and prices are going up and exceeding the highs that we saw a couple months ago, you're going to feel pretty good about it. Mike Gleason: We're about a month away now from the big November election and I'm curious what you're thinking about all of this madness on the campaign trail and what effect do you see the outcome having on the metals specifically? Because David, I think you might be able to make a case that... either it doesn't matter who wins or that gold and silver might get a boost with either outcome. What say you, David? David Smith: I think you could make a case for both of those because you're going to have the flash estimate of the market and it's going to be simple. Who knows what it is… I've heard compelling cases for both sides of what it's going to do for either candidate. But also the fundamental problems haven't been worked on at all and you're assuming that whoever gets to be president is going to have this massive hand that brings solutions to all sorts of problems and the reality is first among equals, there's hundreds of players that are going to pound out decisions that may or may not work. We've got so much systemically going on that has not been addressed for many, many years that this is not going to be solved overnight. So when the prices calm down, whether they have a bump or whether they have a drop, they're going to get back to reality and people are going to go, "Okay, where are we now and where are we going to go over the next few years?" They're going to see that the problem still remains and they're going say, "You know, I'm glad I've got some gold and silver, because it's real money, it always has been and it'll help insure me against the depredations of the government is going to do, which often doesn't work." Mike Gleason: They certainly are the true safe havens and I think more and more people will be recognizing them to be just that, especially into next year just like you were writing about in that article. Well David, as we begin to close here, any final thoughts on what the rest of the year might hold and then also give us some information on the book that you and David Morgan are working on because when I saw you last in late August, you were hard at work on that and you told me this is a book that you and David really believe needed to get out to the public this year. So talk about that as well as we begin to wrap up. David Smith: Okay, well let me give people a link first of all that they might want to look at. I just read this this morning. Bob Moriarty, and you can find it on his site at 321gold.com. He wrote something to the effect of, "I'm a buyer at $16 silver." Look at this as not so much a predictor of where you should buy silver at $16 or whatever, but look at it as a way to calm yourself down and see the bigger picture. And Bob has an unerring ability to catch big turns. Not to the day, but within a reasonable time frame. And I think if people read what he writes, I think that will help them see the bigger picture and put things into perspective. Regarding the book that David and I are working on, we hope to have it available for the Gold and Silver Summit November 14th & 15th in San Francisco. It's going to be pretty tight but it certainly will be available soon thereafter. I was just talking to the publisher today and doing some things on it, waiting for that first galley. But it's called Second Chance How To Make and Keep Big Money During the Coming Gold and Silver Shock Wave. That's a pretty good mouthful for a title but it says what we really want to get out there. The idea that the second chance, you may have missed it in the run up in 2011. You may have missed what's going on now. You may have invested in May and now you're under water. The point is, this is just the beginning of the third major secular up-leg in gold and silver that we believe will take them to all-time nominal highs, well above anything that they've achieved before. The idea too, a lot of times most of the books that you'll see something like this is about how to make a lot of money in the markets but it doesn't talk at all about how to hang on to it. And so we believe that there's a sensible way to deal with your profits when they accrue so that you can keep a lot of those profits when the market finally turns down some years hence, rather than ending up riding it all the way up and all the way down like people did in dot-com 2000, and like they've done in most other booms and busts. We've got a long way ahead of us for higher metals prices but at some point you'll need to reassess that when those price levels are achieved. So we want to give people an opportunity to think about it that way and we're directing our book at two primary groups. We're directing it at the Baby Boomers, the people that were born between 1946 and 1964 and the Millennials who were born from about 1982 to 2004. Both David Morgan and myself have two millennials that we have raised. We feel this might be a way to help out a little bit and give something back to the people in our children's generation who are going to be the new leaders who are going to take over when the Baby Boomers step off the stage after all the mess they've made and we hope the Millennials can get things put together. But this is an important time in our history and we believe that it's an important time to be thinking about the biggest picture and we think that the precious metals play a very important role in helping people to end up with the wherewithal and the insurance coverage to, as we go through that new great gate of destiny that Neil Howell talks about and Strauss in the book before The Turning. It will be a generational change, we want to have the Millennials and the Boomers too, who are both under-capitalized and under-financed right now, we want to help them perhaps move to a little better space financially and not to mention emotionally so that they can be change agents along the way and help out and also be people that are independent and can help in the rebuild process rather than people that are standing in line waiting for the government to do something to get them off the dime. Mike Gleason: Really looking forward to that. I'm sure it's going to be fantastic information. You and David putting your minds together and your experience into a book is going to be very exciting. David, it's always enlightening to hear your thoughts and listen to your wisdom. Thanks once again for your time and your excellent insights. Keep up the great work. Good luck with the upcoming book and we'll look forward to your next article for MoneyMetals.com. It's always great stuff there as well. I hope you enjoy your weekend, my friend. We'll talk to you again soon. David Smith: Thank you very much, Mike. Have a good weekend and we'll look forward to speaking again. Mike Gleason: That will do it for this week. Thanks again to David Smith, Senior Analyst at The Morgan Report and regular contributor and regular columnist for MoneyMetals.com. To check out any of David's insightful columns, just go to the news section on MoneyMetals.com or just type in David Smith in the search box and you'll get links to all of his fabulous work. Be sure to check that out. Check back here next Friday for our next Weekly Market Wrap Podcast. Until then, this has been Mike Gleason with Money Metals Exchange. Thanks for listening and have a great weekend, everybody.